1. Dysert O'Dea. East Face. General View. 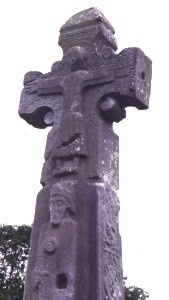 This limestone cross is situated near the Church at Dysert O'Dea. Its measurements are 2.77 m high x 1.02 m at the arms. The shaft measures 65 cm x 37.5 cm. The base measures 1.02 m x 1.28 m and 50cm high. This is a general view of the limestone cross at Dysert O'Dea. Buckley, M.J.C., , ‘Notes on Boundary Crosses’. In Journal of the Royal Society of Antiquaries of Ireland (1900) 30, 247-252. De Paor, L., , ‘The limestone crosses of Clare and Aran’. In Journal of the Galway Archaeological and Historical Society (1955/56) 26, 53-71. De Paor, L., De Paor, M., Early Christian Ireland 1st, , London (1958) . Fitzgerald, W., , ‘The Dysart O'Dea High Cross, Parish of Dysart (tola)’. In Journal of the Society for the Preservation of the Memorials of the Dead Ireland (1913) 9, 21. Henry, F., , ‘Cruz de Piedra’. In El Arte Románico (Exhibition Catalogue) (1961) 3. Henry, F., Irish Art in the Romanesque Period (1020-1170 A.D.) 1st, , London (1970) . MacNamara, G.U., , ‘The Ancient Stone Crosses of Ui-Fearmaic, Co. Clare, part I’. In Journal of the Royal Society of Antiquaries of Ireland (1899) 29, 244-255. MacNamara, G.U., , ‘The Cross of Dysert O'Dea’. In Journal of the Royal Society of Antiquaries of Ireland (1900) 30, 377-378. Multhaupt, H., Glaubensspuren, Meditationem zu Irischen Hochkreuzen 1st, , Regensburg (1980) . Streit, J., Sone und Kreuz. Irland zwischen megalithkultur und fruhem Christentum 1st, , Stuttgart (1977) . Westropp, T.J., , ‘Churches with Round Towers in Northern Clare (Part II)’. In Journal of the Royal Society of Antiquaries of Ireland (1894) 24, 150-159. Westropp, T.J., , ‘The Cross of Dysert O'Dea’. In Journal of the Royal Society of Antiquaries of Ireland (1900) 30, 375-377. Westropp, T.J., , ‘Excursions of the Royal Society of Antiquaries of Ireland, summer meeting 1900. Description of the places visited section III, third excursion’. In Journal of the Royal Society of Antiquaries of Ireland (1900) 30, 392-419.